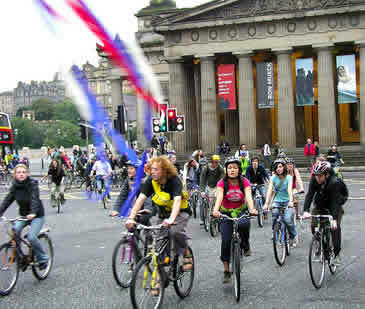 Critical Mass is a mass bicycle ride that takes place on the last Friday of every month in cities around the world. It was started in San Francisco in 1992 by cyclists and activists who wanted to increase the visibility of bicyclists and reclaim public space by making social use of the streets on a regular basis. What actually happens on a ride? The Edinburgh contingent meets from 6.30pm at Mid Meadow Walk, then we set off just after 7pm (we used to meet at 5.30pm outside the Scottish National Gallery but that’s changed). We cycle in a group around the city, waving to people and having a chat with each other as we go. The idea is to have a safe and enjoyable ride. We try to follow a few principles so that the needs of the whole group are met. Normally someone will say a few words before the ride so that everybody is aware of the importance of riding together as a group and how best to maintain this. However, the mass is an organic and dynamic entity – individuals are free to do what they want, but in general we tend to stay together as a group. What route do you take? Critical Mass rides have no set route; it is up to those at the front to decide where to go and the rest of the mass follows. People tend to avoid Edinburgh’s larger hills, and typically we would stick to central areas, but riding with the mass is utterly unpredictable and you might just find yourself somewhere that you’ve never been before! It’s always an adventure, and no two rides are ever the same. For illustrative purposes, here is a map of our ride from January 2014. Critical Mass is not a race! It’s a group ride and so we go as fast as the slowest rider. Sometimes the group might stretch out a little due to different natural speeds, but the purpose of the Critical Mass ride is to have fun together, and so people tend to gravitate back to the group. What sort of people come to Critical Mass, and why? All sorts of people come to Critical Mass, and they come for many different reasons. Some people come because it’s fun. Some people enjoy the safety and freedom of riding in a group. Some people want to promote the visibility of cycling. And some people just like being part of the community of riders. Critical Mass means different things to different people, and we embrace and celebrate its diversity. The ride is open to anyone on self-propelled wheels – you don’t necessarily have to be a cyclist! The length of the ride varies and it is best to think of length in terms of time rather than distance. It could be just an hour or so, or perhaps a bit longer, but it depends on many factors such as the time of the year, the weather, the size of the group, but most importantly you. There is no obligation to stay with the group, and at any time, and for any reason, you are free to finish riding. Perhaps we pass right by your house, perhaps you have a dinner waiting for you, or perhaps you’re just having too much fun and you can’t handle it! People are more than welcome to come and go as they please. Coming along for a ride doesn’t commit you to cycling in the rain should it suddenly start to pour! Often we will do something after the ride and may have a set time by which we aim to finish. Recently we had a film night at the Autonomous Centre of Edinburgh, so we made our way down there for 7.30pm. But again, you can keep riding all night if you want! We might suggest a drink or some food somewhere as this helps to strengthen our community. We are always looking for new things to do, and we welcome any suggestions for fun post-ride events. Nobody runs Critical Mass! There is no organised structure and no leaders – Critical Mass belongs to the people. We occasionally hold meetings to discuss things like publicity and events, and anyone who is interested is welcome to come along and participate: we really value a diversity of inputs. These meetings may take the form of an informal gathering at someone’s house or a cafe. Anyone can call one of these meetings and anyone can go. Easy, you just need to turn up. The ride is safe. In a group, cyclists are much more visible to other roads users. Definitely, everybody is welcome! Critical Mass aims to provide a safe and friendly environment for those that might normally feel intimidated on the roads. Do you stop for red lights/obey the traffic laws? We follow the Highway Code; we yield to emergency vehicles, we respect other road users, and as individuals we are responsible for making sure that our bikes are in a roadworthy condition. While we do aim to stop at red-lights, the strength and safety of the Critical Mass is in its close-knit unity as an organic body – what this means is that it is sometimes necessary to ride through red lights in order to maintain the group’s unity. If the group is significantly large, and if the green light sequence is too short to get everyone through, it is actually safer to behave this way as other vehicles are less tempted to try to weave in and out among smaller groups of riders. Of course Critical Mass is fun! Underneath it all this is the main reason why people look forward to it and keep coming back every month! The mass offers a great opportunity to meet other cyclists, ride in safety, and explore the city from a different perspective. Our recent acquisition of a sound-system means that we’ve turned our ride into something of a mobile party – it really is a uniquely brilliant experience, and definitely something to tell your friends about.